A recent study, published in The American Journal of Medicine, states that people who consume a “western style diet” have a greater risk of premature death. What is a “western style diet?” Consider the foods that Americans love – fried and sweet food, processed and red meat, high fat dairy products, and refined grains. According to researchers, this highly-processed diet not only leads to lifestyle-related diseases such as heart disease, cancer, and obesity, but also reduces “ideal aging” and leads to an earlier death. The old adage “you are what you eat” is, in fact, true. You are made up of trillions of cells, highly organized into specific tissues that make up organs, muscles, and glands. These cells are made from the ingredients that you provide, so it’s up to you to provide good ingredients or bad ingredients! If you were building a house, would you rather high-quality materials or the stuff you found near the dumpster? Hopefully the former! 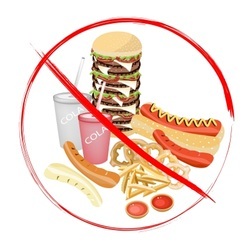 However, on a daily basis most Americans fill their body with dumpster food, leading them to have unhealthy cells that make up unhealthy tissue and an unhealthy body. Want to be healthier tomorrow? Change your diet today! Cut down on and eliminate processed foods and replace them with fresh fruits and vegetables…it’s really that simple!